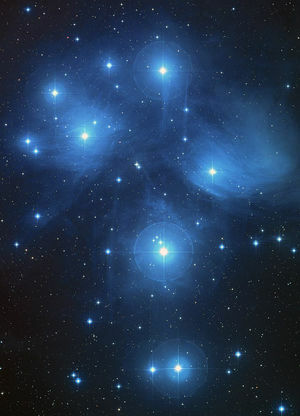 In our portion of the universe, the seat of the Great White Brotherhood is the Pleiades. This cluster of stars was named by the Greeks for the seven daughters of Atlas and Pleione. The cluster is situated in the constellation Taurus at a distance of four hundred light years from earth and has an angular size somewhat larger than that of the moon. Of the five hundred stars in the group, six are easily visible to the naked eye. These stars are known from ancient times as the Seven Sisters (the seventh Pleiad was, according to legend, lost or in hiding), and they focus the seven rays of the divine feminine. I am this night painting before you the vision of the Holy City, the magnificent City Foursquare, the divine kingdom that shall come upon earth even as you keep the flame. And whenever you see reports of problems, of crises, of injustices in your newspapers, I am calling by the power of the Elohim in the name of Almighty God with the permission of your Holy Christ Selves that that vision of the City Foursquare shall flash forth from your consciousness into the world, into that situation, into the problem areas as a divine matrix of the cosmic cube, that City Foursquare that is the key to each man’s overcoming, the key to the ascension of the very planet itself. That focus is the most powerful image that can be brought forth for the manifestation of Christ and the kingdom of God upon this earth. It contains within it the full power of the World Mother and her divine matrix of the entire material universe for the manifestation of the Christ. Therefore the Elohim admonished all to guard their vision from “the horrendous forms that come through the media, through the television, through the movies.... Let the All-Seeing Eye of God penetrate to ascertain what is occurring in the world, to ascertain the position of the evil forces. And then, let that projection of the cosmic cube be stamped upon them, sealing the place where evil dwells by the power of the Most High God. The entire hierarchy of the Pleiades is behind this experiment for the complete transformation of the planetary orb by the power of the All-Seeing Eye of God. Therefore, I say, I give you the key: Call to the Pleiades and the hierarchies thereof. There are millions of cosmic beings with their cosmic retinues who will come forth in answer to your prayer, millions of Cosmic Christs who will carry into manifestation that divine blueprint. ↑ Pearls of Wisdom 1978, pp. 390–91. This page was last modified on 24 October 2016, at 08:57.